And a happy Vesak (aka Fódàn or वैशाख | Vaiśākha | 佛誕 | 佛诞 | 석가탄신일| 灌仏会 | Phật Đản or Buddha's Birthday). As with so many things, if you try to find the date of the day, you will have a hard time ... various Buddhist regions celebrate on different days, but it's roughly the first week of the first full moon in May ... this year, Indian and Nepalese are celebrating today, 14 May. 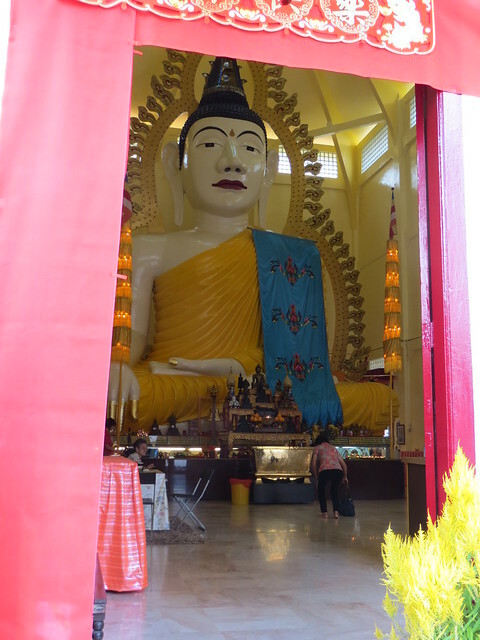 The Buddha here is from the Sakya Muni Buddha Gaya Temple, Little India, Singapore with the Buddha in the bhumisparsha-mudra position (Buddha at the moment of victory). Here is Buddha at the moment of enlightenment, touching the earth (not the sky) to show that enlightenment encompasses all things (rocks, dirt, concrete) and is of the earth, not apart from it. More posts about Buddha. And some Flickr photos.